The Moscow Adopt-A-Stream program began in 1991 with initial funding through the Department of Environmental Quality. 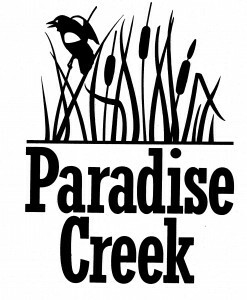 Now called Paradise Creek Adopt-A-Stream, the Palouse-Clearwater Environmental Institute (PCEI) is offering organizations, businesses, schools, churches, and families the opportunity to provide hands-on, localized stewardship of Paradise Creek. Interested groups can become “Stream Stewards” and adopt a section of Paradise Creek to maintain through stream cleanings. Participation in this stewardship project will provide visibility and advertisement opportunities for your group similar to the Adopt-A-Highway Program. Stream Stewards will have their name or logo displayed below the Paradise Creek logo (pictured above right) on a highway grade aluminum sign measuring 12″ x 18″. Stream Stewards commit to cleaning their adopted segment twice a year. Additional cleanup activities are supported and encouraged. Once payment is received, signs will be located/installed at a vehicle or pedestrian bridge crossing, preferably adjacent to the section that your group has chosen to adopt. If you or your organization decides to forfeit the adopted segment, we request that you contact PCEI as soon as possible. This Adopt-A-Stream program is designed to recognize the commitment and responsibilities of the Stream Stewards and will not change the legal ownership of any land. The program is meant to improve the community participation and care of our waterways. PCEI encourages all Stream Stewards to work with the landowners on your section of stream, but respect their right to privacy. Possibly the greatest benefit to this stewardship program is the difference that your group can make in cleaning up the riparian areas along Paradise Creek resulting in the improvement in water quality along the stream segment you choose to adopt. Become a Stream Steward today! Weight loss is something some of us finds it hard to accomplish, have a look at this article via phentermineonlinepro.com to learn how to lose weight losing phentermine.